I wanted to wait a week before doing an accounting of my 2017 Hamvention experiences. Needed that long for the wasp sting I somehow got, the impact of the hot weather, the soreness from the long drive and all the mud on my car to all become just memories. First I cannot overstate how little I miss the nasty old Hara. Though I knew where things were and like an old pair of shoes, there was a certain comfort in familiarity the place simply sucked. Xenia Fairgrounds is a nicer than typical small town multi-purpose fairgrounds. I happen to love small town America, and personally value the “Norman Rockwell” characteristics of real America. I’d never been to Xenia but I’ve been a hundred places like Xenia. This year I traveled with my wife Alison KC9MPL and with friend & neighbor the venerable George Ulm W9EVT. George’s wife Susan had to cancel on short notice as their dog needed special care which was going to go better if one of them stayed back at their farm. We stayed in a new complex in Miamisburg, Ohio, at the Hilton Garden Hotel that also hosted the FlexRadio System Banquets. The hotel was four years old and basically a better grade traveler’s hotel. Rates were typical and the surrounding amenities were awesome. George said he had a couple small problems with his room, but ours was flawless. The staff was super helpful. We arrived in time to make the FlexRadio Systems Contester/DXer Banquet on Thursday evening, where the new Flex-6400, Flex-6600, Flex-6400M and Flex-6600M were launched. Very good banquet with lots of news, and with lots of people to talk to. I was a bit road-weary and did not do my best at talking to all the people I had wanted to meet up with. Did have a great chat with AB5ED Abed, who is a longtime FRS software engineer. Abed impressed me asking after my son Winston KC9FVR as they had met at a FRS banquet five years prior. Friday morning after breakfast in the hotel we set off for Xenia, aiming for the main parking. Unfortunately we were a long time in traffic, due to what we later found out was a traffic accident. We’d dropped Alison off at the K & G Bicycle Shop where she went off on her own to rent a bike and do the area trails. Parking went smooth once the accident was cleared (hopefully nobody was hurt) and a fellow with a golf cart came over to help George W9EVT to the Scooter Tent. At 86 years of age George will out lift, carry and outwalk younger hams, but unfortunately not for all day anymore. So George starts the day using the Scooter to get to the end of a row or to a building/tent and then walks the area, but by lunchtime he needs to ride the Scooter more. The Scootermobile people are super nice and took care of George. Now inside the gates we faced having to learn the new layout. I had of course left in the car my annotated “must see” map of exhibitors I wanted to catch up with. Some things seem to never change when it comes to self-inflicted chaos. Finding our way into the tents we had a really good long talk with the new owner of TenTec and Alpha Amplifiers. Owner/President Mike N8WFF is a US Navy veteran and we had a really great talk about his plans for the companies. Talk about a rescue, as both Alpha Amplifiers and TenTec were on their way to disappear having a “can do” fellow like Mike N8WFF pick up the pieces is inspiring. We did leave with the impression that if Mike N8WFF were to team up with a partner who was marketing & sales orientated the recovery would be quicker. But that is arm chair quarterbacking at best. BTW the Alpha 4040 Mike says will be finished this year. Yeah! On the tents, they were too tight for supersized hams, scooters and people carrying ham sized gear. Hoping the spacing is improved for 2018. The big exhibition sheds are multipurpose agricultural type metal buildings on concrete slabs. If you live in a Midwestern small town like I do, you’ve been in these sorts of buildings for everything from seeing the FFA (Future Farmers of America) Animal Judging at county fair time, to Craft Beer Brewing events to quilting shows… and everything in between. The lack of Air Conditioning was a bit ugly on Friday, with outside temperatures perhaps getting into the 90’s. In fairness we’d had bring some outside plants in the house when we left due to frost warnings, so some of temperature complaint was my not being accustomed yet to warm weather this year. Visited FlexRadio Systems, DX Engineering, Icom, Arlan Communications (RadioSport), RadioWavz, Array Solutions, Amsat, and dozens more that I had marked in my program as “must see.” Spent some time talking with Ranko 4o3a and other celebrity vendors. It was hot enough that the Beer Garden was of more interest than eating. There was a Steel Drummer playing and an endless choice of foods vendors. Of course huge rain storm had to move in, so we retreated to the sheds. In the end we waited to have a late lunch in the hipster village of Yellow Springs, as Alison had put in their hiding from the rain & lightning while bicycling. The area trails are really excellent she reports, having done about 40 miles in her casual ride. While our exit from the fairgrounds had been smooth and quick, I hadn’t let myself get caught in the wrong lane leaving Xenia requiring a 2-3 mile backtrack as a result, nonetheless our ride back to the hotel was quick if very wet. Friday evening we dressed up and took in the Collins Collectors Association Banquet held at the Miami Valley Country Club. The country club is about 4 miles south of the old remote parking at the former Salem Mall and is a wonderful retro-swank old style club. At the table I was sat next to Mike March K4QU of Morse key making renown. He does some keys in conjunction with a master engraver, and once she is done these are fantastic works of art that also rock for sending code. https://sites.google.com/site/marchmagneticpaddles/ is his website. Saturday saw George W9EVT and myself off to the show early, meeting with my cousin Dale N6JSX for a final morning of looking around. Heavy rains dampened out enthusiasm and we headed back to the hotel early than planned. Alison spent the day touring with Dale’s wife Becky N9KUV. George W9EVT bowed out for our third banquet of Hamvention 2017, the general audience targeted FlexRadio System Banquet. This was an excellent event as Mac W4AX did an outstanding presentation on use of the USB control from your Flex-6000 to automate your station – https://community.flexradio.com/flexradio/topics/flexradio-usb-configuration-possibilities has some of his charts. Basically a Flex-6000 has a programmable interface by USB that can control about every aspect of your station, right down to an “On the Air” sign! We had a really good chat with fellow NEWDXA member Jerry K9USN. Again I think I missed talking to quite a few people I had intended to catch up with, but that happens when your XYL’s feelings need to be taken into consideration. Very early Sunday we hit the road, and dove first home, then with another of my sons Victor KC9NWB drove George W9EVT the last 115 miles up to the ferry that takes him to his Island. Was Hamvention 2017 better for all the changes? Resoundingly YES. Was it all worked out and perfect? No but it wasn’t bad either. The swap mart got all muddy – that isn’t bad compared to sewage volcanos bubbling up in the swap meet area like at the Hara. The exhibition sheds were hot – but they were despite claims of A/C at the Hara. The beer garden was outside compared to the ice cold bar room at the Hara, but also it was possible to get a beer instantly compared to the Hara 20 minutes in line. Different Hamvention – some stuff better, some stuff worse, and all things Ham! What are our 2018 plans? Undecided, but not for Hamvention reasons, but because of other travel opportunity reasons. Glad we went, good time had by all and a tip of the hat to the DARA team for making a difficult transition work out. In the last 45 days, we’ve made a lot of progress on the Alpha 4040 DreamTuner. As you know, when we tested the tuner under full power, we discovered that the switches weren’t delivering the performance we needed. Dissatisfied with the test results, and knowing it would push the delivery out, we undertook a massive redesign including a new, commercial pad cap, custom antenna switches, and a new layout. The fruit of our labors is a very efficient tuner that is an industry leader in both matching range and power handling. We ARE shipping beta units this month. Our first unit already shipped to the owner of RF Concepts, Michael Seedman, AA6DY and he was pleased with the changes and overall design of the tuner. This is a different tuner than we showed at Dayton last May. Here’s a picture of the insides. We’re planning on posting a new section in the website with lots of photos and details. P.S. We are accepting pre-orders. These orders are non-binding, with no deposit necessary. Click HERE to learn more. Here’s the unit with redesigned exterior sheet metal, up and running. The Alpha 4040’s enclosure is designed to support the weight of an 80 pound plus amplifier. There are no protruding screw heads, this allows for easy stacking and placement of a whole variety of gear atop the tuner. Capacitor mounts and shaft couplers redesigned to limit stray capacitance. Inductor design changed and resonance breaker added to reduce stay inductance. Coupler design changed to improve overall Vector Network Analyzer performance. Antenna and bypass switch changed to handle the voltage and current they will be subject to at high VSWR. Another benefit of the new switch design is that the bypass VSWR, even at 6m, is excellent. This design will also allow you to combine two of the antenna ports. 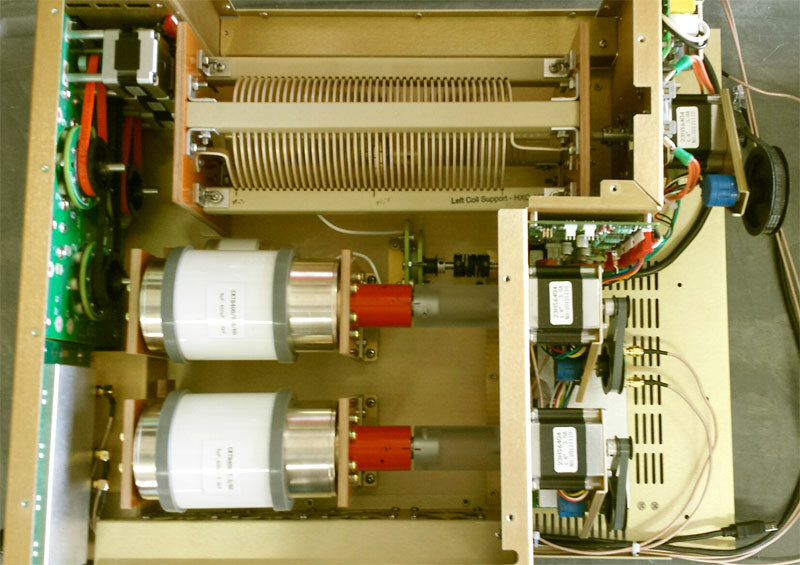 Capacitors were moved towards the back to decrease stay inductance and reduce overall length. The new design allows for easier assembly and repair along with a much lower weight. New mounting of stepper motors designed to simplify sheet metal and improve electrical shielding. Computer upgraded to newer higher performance 1GHz model. All software was ported to utilize the new PC. Printed circuit board assemblies were changed to fit into new metal design. The reduction in minimum capacitance and inductance has dramatically improved the matching range of the tuner, especially at higher frequencies. The back panel redesign was driven by the new switch design. It accommodates Bird type QC connectors. If the A4040 is used to transform high SWR at high power different connectors will be required, e.g. 7/16 DIN. You can easily destroy SO239, PL259 connectors with the voltages that could be present at the connector location with this tuner. The repositioned LAN port allows for convenient wired connectivity. The Alpha 4040 is fully network enabled for remote control and online software updates. Front panel display has been moved to the left to allow for reducing the overall length. Bezel depth decreased to facilitate greater viewing angles. Tuning knob moved down to facilitate length reduction. Check out the RF Concepts Website at http://www.rfconcepts.com/ for further details!